Art. I am talking about the physical art: paintings, sculptures, portraits and ceramics. These types of artworks are what make museums or art collections unique. When I look at such artwork, I spend so much time trying to interpret what the artists create. There may be little information displayed about the specific piece or the artist, but honestly how many people actually read it. What I enjoy most about looking at artwork is when I am able to get lost in my own thoughts to help me make sense of the artwork that is right in front of me. Last week, while visiting St. Olaf’s Flaten Art Museum. There was a lot of interesting artwork displayed. There was one piece of artwork that stood out. This ceramic jar was created by Steven Lucas in 1988, but does not have a title. Lucas identifies as Native American and belongs to the Mudhead Katsina clan and is one of the artists associated with the Hopi-Tewa Pottery. Their art is based in Arizona and New Mexico. Another interesting fact is that the name Hopi-Tewa represents two different clans that came together to continue a tradition of ceramic art (Michael Smith Gallary). What struck out to me about the jar is how symmetrical the shapes are and they are almost perfectly drawn. The shapes are simplistic yet the combination of many shapes make the pattern seem complex. 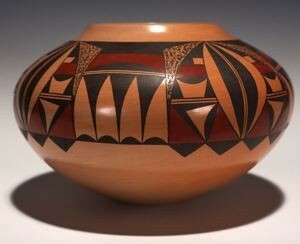 When initially looking at this jar, there was not a specific culture that I could associate this jar with, until I discovered that the artist is Native American. It connected the dots and provided validity. In studying American Music History, this artwork pares well with Native American music and culture. All types of art created by Native-Americans are beautifully constructed and tell a story. This jar, I wonder what story Steve Lucas is trying to tell? I think that all of the pottery that is created by Lucas and other artist alike tell the story of the unification of two clan traditions and how they have continued to celebrate their culture through art. This entry was posted in Wenie Lado and tagged Artwork, Hopi-Tewa, Native American Music by Wenie. Bookmark the permalink.